When we bring plants to our home and plant them, it becomes our implied responsibility to provide proper care to the plants we've brought in. Without proper care, the plants will die and that, I suppose no gardener ever wants. A plant may need a variety of care in order to grow and sustain well. With proper care, plants can grow well and that is every gardener's delight to see his/her plants growing well. Though all plants need care, caring for plants becomes much more important when the plants are placed in containers, or somewhere, plants are not meant to naturally be. For our potted plants, we need to take a lot of care as a plant is completely dependent on us for its nutritional and other needs to grow well, because it doesn't have any scope to be dependent on the nature and its mechanisms to fulfill its needs as it is confined by us, in pots, with limited supply of soil, water and other nutrients for its growth, as against plants on land where plants can get some part of their nutritional and other needs from the land itself. This is when proper care for plants is needed. One of the most important aspect in plant care is watering. Though everybody knows that water is very essential for all the plants, and plants won't make out without water. Water requirements of plants depend on the type of plant you're growing for example, most flowering plants need a good amount and frequent watering, while succulents and xerophytic plants can sustain a longer duration without water, but ultimately, these also need water. Since I am into container gardening, I won't go into much detail about common gardening practices on land, and will try to keep myself restricted to gardening in containers. Here, I am listing some best practices that, I follow to keep my plants growing well and healthy, and believe me, I have a great record of plant sustainability. May be the practices I follow might not fit completely to your case, but the basic idea behind doing these things and the ways remain almost same. 1. Identify the plants according to their categories: For example, succulents and cactii need less frequent watering, while other common gardening plants might need more frequent watering. 2. Identify the sizes of the containers your plants are in: As a matter of common fact, larger containers or pots might hold larger amounts of soil and thus be able to retain the water for longer duration, while smaller ones with comparatively lesser soil might need watering at frequent duration. 3. Having an idea of the type of soil you're using is an added advantage: For example, some variety of clayey soils hold water for longer durations as clayey soils have a higher water retention capacity compared to other varieties of soils. So, you should have a basic idea of the soil type you're using. For a rough idea of the type of soils and their basic characteristics you can checkout this page. And for a rough idea of the soil type in your region you can check out this map. 4. Having an idea about the weather of the region also helps you the plants suitable for your region and the water requirements of the plants suitable for your region. Seasonal variation also plays a very great amount of role in the water requirements of plants you've planted. Like, for me, during this period of time (summer months May to mid july), it becomes necessary to water my plant pots about three times a day. So, I (infact my mother, in my absense during day) take care of the watering the plants in the morning, in the afternoon and in the evening as well. While during monsoon, it won't be necessary at all to water any of the plants. And in winters the watering frequency comes down to a couple of days. 5. The age of your plants is an important factor in determining the water needs for the plant. Generally young plants with tender leaves and stem and a not so established root network need more water than some hardened old plants. 6. Apart from helping plants grow, regular watering also helps plants fight against frost bite during cold winter months. 7. When you're going out on a holiday, you should make some alternative arrangement for watering your plants. You can ask for help from your generous neighbour for this. Some DIY (Do It Yourself) lovers can design a good drip irrigation system attached with a tank using some hose pipes to supply water to your plants in your absense. But, such a thing should be thoroughly tested before actually using it, or it could have drastic effects. Tips for watering potted plants. 1. Unlike regular land plants that can even sustain some of harsh behaviour, while watering, you need to take care while watering potted plants. I prefer watering my plants using a hose pipe, and try not to let a steady stream of water fall directly on the soil in the pot, instead I block the outlet of the hose with my fingers to sort of spray the water over the plants. This way, I sometimes save some soil and compost from flowing out of the pots due to the force of water. Also, watering this way, helps in not exposing the roots of your plants. 2. The top layer of your plant's pot may disguise you into believing that the plant drastically needs water. Infact, since the top layer is directly in contact with the sunlight, it gets dried up, but there are great chances that the soil inside might be moist. Make sure that you're not believing this if you haven't watered your plant for a while. 3. Both underwatering and overwatering has a great potential to damage your plants beyond repair. 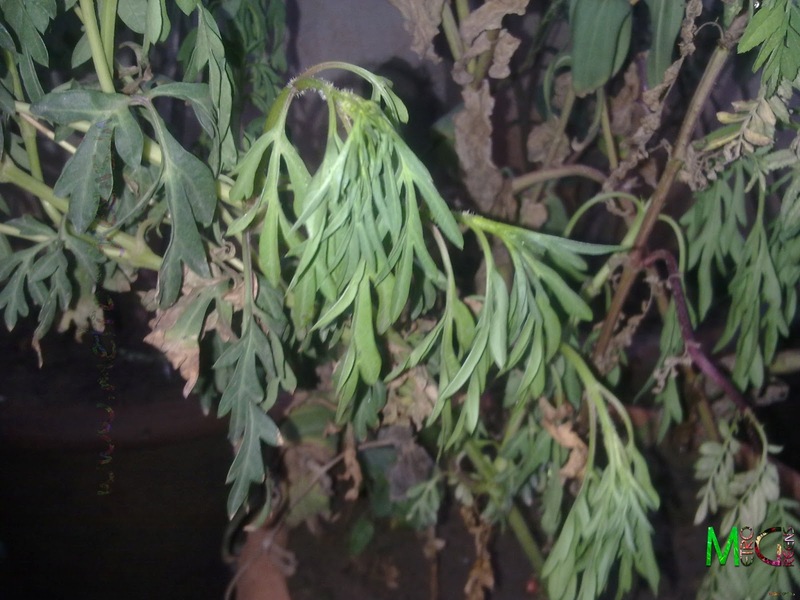 While under watering will expose your plants to acute shortage of water and eventually drying out, over watering may rot the plant's roots and stems and also allows the growth of parasitic, fungul and bacterial diseases of plants. Watering should be done in good amounts. Most of the containers have some space usually at the bottom to let excess water out. Make sure that before using that container, you are restricting (not blocking) the flow through that space to some extent using a small pebble or something. Doing this will block the flow of soil from the pot along with excess water through that hole. Whenever you're planting indoors, you can make use of sort of saucers available for this purpose. Usually these are plastic saucers readily available with any store selling gardening equipments and supplies. These may help in collecting excess water flowing out of your pots and won't let that water soil your floors or carpets. 4. While regular fresh water is quite good for plants, one should use rain water whenever it is available, as, somehow, rain water is much more well suited for plants' growth. 5. It is normal for most plants to wilt due to shortage of water. One should immediately water such plants, otherwise there are chances that such a plant may not survive. Also, one should make sure that wilting shouldn't happen with seedlings and newer plants, as recovery of such plants becomes too much difficult. 6. Using some sort of shade to cover up your plants from direct sun light in extreme summer months and extreme winters could actually save your plants.This protects your plants from direct sunlight from the sun, thus protecting fast evaporation and evapo-transpiration of the water from the soil and plant leaves. Some people do suggest mulching as a method to safeguard valuable soil moisture from your plants, but I haven't found this working satisfactorily in my case, as any mulch, I use on the soils in pots get washed away over time due to watering. A temporarily wilted cosmos plant due to shortage of water. 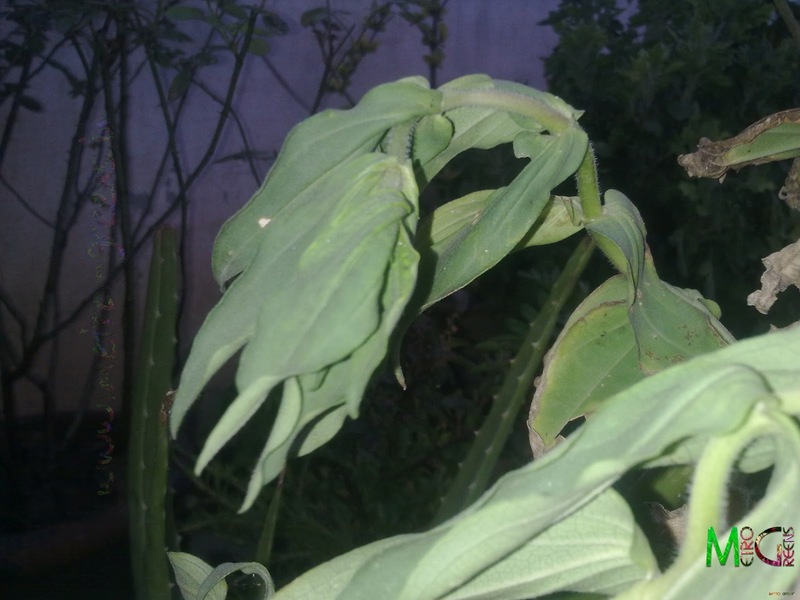 A temporarily wilted zinnia plant due to shortage of water. Don't worry, both these plants have wilted temporarily due to excessive heat and somewhat ignorance on my part to water them in the afternoon. Now, when I water them up, both these plants would be up straightaway. I'll be back with some more tips on caring for potted plants in the upcoming posts. You can also share some of your tips related to the topic in the comments section, which will be greatly appreciated. Till then, keep visiting and HAPPY GARDENING! It has become a trend to cover the home exteriors with living walls because they are environmental friendly and beautiful to look.